Slow Bullets is a story about a group of people and how they deal with the end of their world. I think, I'm not sure really. 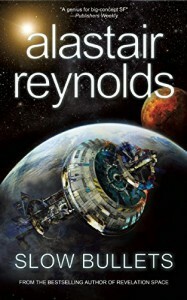 This is my second Reynolds story, the first I read was the short story Troika. This story takes place mostly on a ship. There is very little description of that ship so I had trouble grasping the size, shape and anything else. Which for me is unusual because I'm not one for much technical details, they usually bore me and are beyond my simple grasp of science, but they were needed here since most of the story takes place on this ship. Our main character was female, a female soldier in fact but that was all there was about her that was interesting. And our title comes from a small object injected into these soldiers with their complete biographies and other details, why I don't know. I don't think I missed it but I didn't quite understand why they were injected with these bullets, why all the data was necessary or really anything else. It wasn't a horrible story, I've actually read some horrible ones I put down and never picked up again. I finished this story and it was a simple read, I just didn't grasp the why of it. Our characters were shoved in a ship at the end of a war and woke up thousands of years later and coped.. That's it.. that's all there is to it. It really could have been so much better. I think my dabble into Alastair Reynolds is over after two stories.